ADA International provides a complete drilling project management service for offshore and onshore single or multiple exploration and production well campaigns. 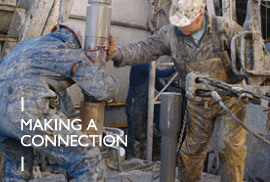 The ADA team is structured like an oil company's conventional drilling department providing an experienced team to manage the entire project, including project planning, well design and costing, obtaining the relevant regulatory approvals, contracting of all services, operations management, and project close-out. A key advantage of outsourcing project management is the immediate access to a multi-disciplined team specific to a project. Particularly for junior independents, but larger operators as well, it eliminates the need for a permanent drilling department, associated overheads and ongoing costs during idle periods. Closing out the project with the pre-agreed documents and reports.